BizMerlin is a highly appreciated and award winning human resource management platform that currently serves more 1,000 small and medium-sized enterprises to help them run their human resources departments. The software is widely used by companies to help them attract and hire the best candidates and improve their retention rates significantly. BizMerlin provides businesses and organizations with an integrated core of functionalities that streamline HR-related processs. These features include hiring automation and applicant tracking, effortless onboarding, allocation and financial management, skill matrix, and asset management. 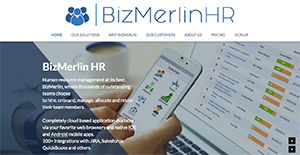 Many companies rely on BizMerlin to help them run their HR processes. The software works and the pricing is very affordable. On top of that, customer support is knowledgeable, responsive, and polite. If you want an human resource management platform that does all the heavy while bringing down operational costs and maximizing revenue, then you can’t go wrong with BizMerlin. Comprehensive and versatile, BizMerlin is human resource management solution that can be customized to suit your business requirements as well as your preferences. You don’t have to change your workflows so that you can adapt to the software. BizMerlin can be tailored so you can effortlessly integrate it to your existing setup, enabling you to concentrate on important things instead of spending your precious time setting up the software. BizMerlin delivers a centralized database of people information. This functionality enables you to collect and store complete details of all your team members and access them anytime, anywhere. You can also do the same for skills, documents, trainings, and more. Using the information found in your database, you can create a company directory in an instant as well as set permissions and roles for your members in a flash. Whether you plan to hire internally or look for candidates through external means, BizMerlin has you covered. You can set your search to filter candidates based on skill set, availability and project needs. For external hiring, you can publish your opportunities via websites, job boards, social media channels, and more with ease and speed. If you want to attract candidates of specific caliber and qualifications, you can create a customized hiring process as well as evaluation templates to screen candidates. Do you have an eye in a potential candidate? BizMerlin helps you nurture that individual so that they are ready to perform their duties once they are hired. BizMerlin simplifies onboarding of new hires with its paperless process and features that ensure compliance. You can further improve productivity and performance of your regular employees by setting goals and evaluating their work. BizMerlin has all the tools to ensure that your employees are aware of their roles and how their duties are aligned to your company’s goals, vision, and mission. What Problems Will BizMerlin Solve? Scenario #1: A new customer that was interested in conducting quarterly and annual performance reviews had already started their trials with 4 other “leading” HRM systems. When they came to BizMerlin, they were amazed at the speed at which they could get started with the process. Using the inbuilt Performance Reviews feature with Process Automation and Template Library, that makes conducting performance reviews a breeze, they were able to import users, import performance review templates, refine the templates for their organization, assign the reviews to reviewers (including self and peer reviews) and launch their first set of performance reviews for their first thirty users within 40 minutes (while they were still within Day 1 of their 14 day trial period). Scenario #2: Improved Hiring for Candidates: A customer wanted to leverage the comprehensive candidate assessment and hiring automation. Using BizMerlin, they were able to start using an objective candidate assessment testing powered by Wonscore, and using BizMerlin’s AI powered system recommendation feature, they were able to see a consolidated recommendation instead of a mish mash of recommendations given by different interviewers. Scenario #3: An existing customer wanted to plan for changes in their workforce (new hires, retirements, employee churn) and changes in their projects (new projects, project extensions, project expansions, changes in role, and project cancellations). Using BizMerlin’s sophisticated workforce planning module, they were able to analyze, calculate and then act upon their workforce needs, in terms of hiring, retraining and reallocation. If you are considering BizMerlin it might also be sensible to investigate other subcategories of Best HR Software listed in our base of SaaS software reviews. It's crucial to realize that hardly any software in the HR Software category will be an ideal solution able to match all the needs of various business types, sizes and industries. It may be a good idea to read a few BizMerlin reviews first as certain software may dominate exclusively in a really narrow group of applications or be created with a really specific type of industry in mind. Others might work with a goal of being simple and intuitive and as a result lack complicated functionalities desired by more experienced users. You can also come across software that focus on a wide group of users and give you a rich feature set, but this in most cases comes at a more expensive cost of such a service. Be certain that you're aware of your needs so that you pick a service that has exactly the features you search for. How Much Does BizMerlin Cost? We realize that when you make a decision to buy HR Software it’s important not only to see how experts evaluate it in their reviews, but also to find out if the real people and companies that buy it are actually satisfied with the product. That’s why we’ve created our behavior-based Customer Satisfaction Algorithm™ that gathers customer reviews, comments and BizMerlin reviews across a wide range of social media sites. The data is then presented in an easy to digest form showing how many people had positive and negative experience with BizMerlin. With that information at hand you should be equipped to make an informed buying decision that you won’t regret. What are BizMerlin pricing details? What integrations are available for BizMerlin? If you need more information about BizMerlin or you simply have a question let us know what you need and we’ll forward your request directly to the vendor.